Next year is the 75th anniversary of a number of the major events of WW2, and always one to plan ahead, I have been working my way through several rule sets as part of the preparation for several large games I am planning to commemorate the events. World War 2 is a particularly difficult period to get the balance between playability and realism right, so after several false starts, I have returned to one of the first sets I ever played - Spearhead by Arty Conliffe. I've worked through a couple of small scale games to get my head around the rules, and iron out any problems - so now they were in my head (and it is amazing how much stuff I used to get wrong I have found given I have now actually read them!) it was time for a bigger game. I lifted the scenario from the Rapid Fire Normandy Battlegames book - it is scenario 1, which is a hold one village whilst attacking the other scenario for both sides. It involves the DLI, so has local connections for me, and and is interesting as it was the battle where Stan Hollis got his Victoria Cross - he was the only person to be awarded a VC on D-Day. The table was 4' x 3', 1" representing 100 Yards. Rapid Fire scenarios scale very well to about half their table size. I double checked my measurements on Google Maps, and it was spot on. You can see how difficult it is, in June with high crops, you can image the restrictions on vision! 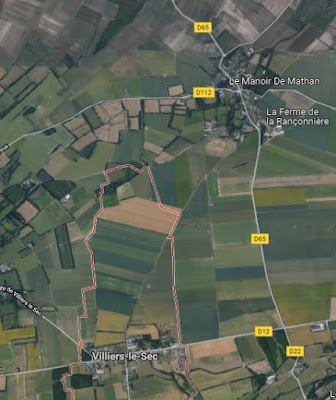 The British 6th Battalion deployed at Crepon, with defend orders, whilst the British 8th Battalion, supported by Ant-Tank units advanced under attack orders on (their) left flank, with the intention of sweeping left onto the village of Villier-le Sec. The 9th Battalion, with armour attached, had orders to advance on (their) right flank as far as the hedgerow, then revert to defend orders, and give support fire. 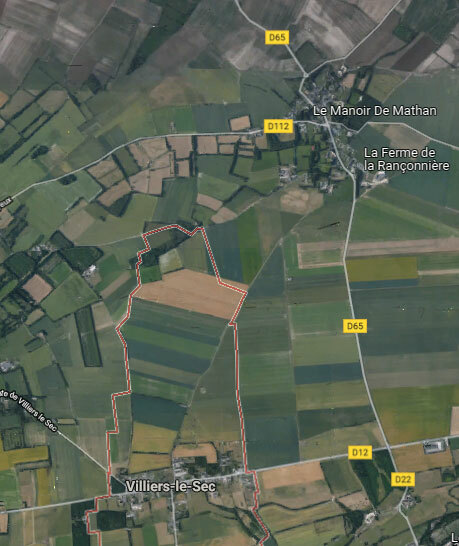 The German 1st Battalion was ordered to advance into Villier-le-Sec, whilst on the German right flank, the 2nd Battalion and the Pioneers were ordered to attack the village of Crepon. Because the respective advances were down the same flank through cornfields (they look like plough in the images, but they represent crops) they basically stumbled into each other when they are 300 yards apart - once of the nice quirks about Spearhead is that you must follow orders until you sight the enemy, which because of the crops, meant 3"...! The resulting combats were brutal, with all German armour destroyed, as well as the British Anti-Tank units...the last stug and the achillies, both stationary, destroyed each other at the same time! Losses mounted up on the German side though, and when they had taken 50% casualties, the 915th Grenadiers broke. The Pioneers were also approaching breaking point, and the German attack was nullified. The other British Battalion, supported by Shermans, then advanced on the German village. We called it at this point, as it was a clear British victory. This was a fantastic game, everything I wanted from the rules - we learned a few things as well. Bob (the German player) realised early in the game that he has misdeployed his 88, and it didn't fire a shot in the entire game as it never had line of sight. Also, because he deployed in depth (Pioneers in the front, Grenadiers to the rear) he had numerous problems making his suppport units as effective as they should have been - in Spearhead, support units can fire through their original fighting Battalions...it is an abstraction to simulate the close co-operation between battalions and their support units. For my part, as British player, I got the tactics just about right - support units (HMGs, Ant-Tank guns and tanks) all working well with mortars to nullify the Germans. 6th Battalion took heavy losses, but the British had 2 Battalions remaining to win the day.